Cleveland's first Lutheran high school was founded in 1948. The school was located near Cleveland State University. The school was one of many buildings torn down in the summer of 1958 to make way for construction of the I-90 Innerbelt. The Lutheran community subsequently made a decision to build two Lutheran high schools, one in Rocky River and one in Cleveland Heights. The new Lutheran High School East was still under construction in the Fall of 1958 so classes for the 1958-59 school year were held at Park Synagogue in Cleveland Heights. 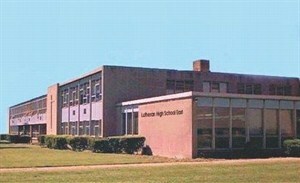 Lutheran High School East's new building (across from Severance Center) opened in September, 1959. Throughout the years, Lutheran High School East has always maintained a Christ-centered environment, where God's Word is taught, prayer is an everyday practice and over 95% of the seniors go to college in a typical year. The influence of Lutheran High School East students does not end following their schooling, however, as graduates have gone on to distinguish themselves professionally in such fields as the arts, medicine, law, religion, business, education, and the sciences. During Lutheran High School East's first 19 years, enrollment ranged from 200 students to a peak of 435 students during the 1970-71 school year. Over the past 30 years enrollment has averaged around 150 students. These students have continuously produced outstanding accomplishments. While the media has focused on its many athletic victories, the school community has also been blessed by student accomplishments in other areas as well, including the Fine Arts. Lutheran High School East celebrates its Christian religious diversity. Students from a vast array of Christian denominations attend the school and grow in their faith during their years in attendance. While Lutheran theology is clearly taught, the greater Christian community is uplifted as an excellent choice for Christian secondary education is made available for all students who desire a closer relationship with their Lord. Lutheran High School East looks forward to a vibrant future even as it celebrates its 50 years of existence on Mayfield Road. We seek the Lord's continued blessing on our school, our alumni and current students, and our extended school community.